Some witnesses seemed to put Sterling and journalist James Risen roughly in the same nefarious category, Sterling for allegedly leaking classified information that put the CIA in a bad light, and Risen for reporting it. Muffled CIA anger was audible, coming from the witness stand, a seat filled by people claiming to view any aspersions on the CIA to be baseless calumnies. 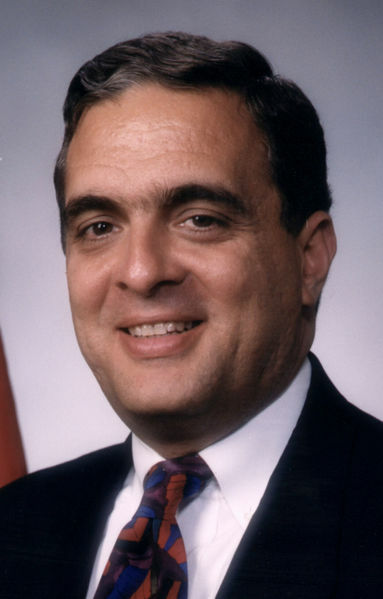 George Tenet, who was CIA director at the time of Operation Merlin. Like other CIA witnesses, Shedd testified in no uncertain terms that Operation Merlin, executed to give a flawed nuclear weapon design to the Iranian government, was expertly planned and then well implemented in 2000. But his testimony included a key statement that was a fundamentally incorrect version of what happened. In reality, as Risen reported in his book State of War, and as all other accounts affirmed in the courtroom, the Russian scientist working for the CIA carried the nuclear diagram to Vienna, and left it in a mailbox at the Iranian mission office without ever speaking with anyone there. But Shedd flatly testified that the scientist had met with someone in Iran when delivering the diagram. Shedd’s authoritative demeanor about Operation Merlin was matched by the incongruous immensity of his error. He had preened himself on the stand as someone who had been the ultra-adept overseer of Operation Merlin, as the direct supervisor of the man (“Bob S,” who testified behind a screen) in charge of that CIA program, touted in court as one of the most vitally important in the agency’s modern era. Just the tip of the iceberg about Agency evil and mishaps. Risen was afraid that any allusions to his sources might lead to John P. Wheeler who was brutally murdered for leaking the use of the Stuxnet virus against Iran’s centrifuge programs – what was far more destructive of computer systems worldwide than the CIA claimed. And then when Wheeler’s body was unexpected discovered on the way to the Wilmington landfill, it had to kill Ali Resa Pahlavi for fear that he would spill the beans about Wheeler’s murder, making it look like a suicide.